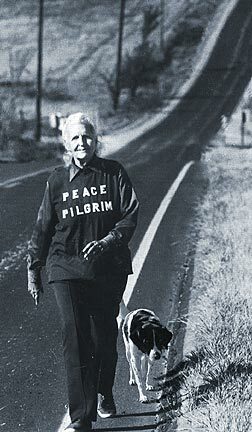 Peace Pilgrim was an extraordinary woman who spent several decades of her life walking across North America with her simple message of peace. 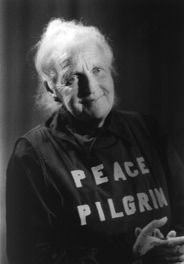 Peace Pilgrim was born in around 1908 on a New Jersey farm. Friends say she was a popular and bright young girl but there was no indication she would make the transition to be a saintly pilgrim. When questioned, Peace Pilgrim briefly mentioned her early life without going into too much detail. She felt these early details unimportant and wanted people to concentrate on the important messages she was spreading. She would often say she wanted to promoted the message and not the messenger. It appears that in her early life she had a reasonably successful job I found making money was easy however she felt that this life was not giving her any fulfilment and she wished to do something more productive. As she said in her own words She began to “live to give instead of living to get” (p.7) Thus from around this turning point of 1938 she began a process of spiritual practices which led to her simplifying her inner life and becoming less self centred. After 15 years of spiritual practice Peace Pilgrim decided to set out on a pilgrimage of peace. Walking 25,000 miles spreading her message of peace. She set out in 1952 at the height of the Korean war and the suspicious period of McCarthyism. Peace Pilgrim herself came under suspicion. Because of his she decided to drop her old name to prevent her sister being hassled. Peace Pilgrim would walk throughout the day only stopping for food when this was offered. Often she did not get proper shelter but she kept maintained a calm and serene approach to even the most difficult of situations. She touched the lives of many, inspiring others to consider what they could do to find inner peace within side themselves. During the 1960s and the Vietnam war she came more to prominence and towards the end of her life she became well known. Often she would speak to packed audiences and led retreats for people interested in following a similar approach to life. Throughout her life Peace Pilgrim had remarkably good health. A feature she attributed to a plain and simple vegetarian diet and living in harmony with the world. Peace Pilgrim died in July 1981 when she was killed instantaneously in a car collision. Peace Pilgrim called death A glorious transition to a freer life. Peace Pilgrim IIA 70 year old man who started his own peace pilgrimage.